I sat down with a paper plate of carrot sticks, cheese cubes, and chocolate chip cookies—standard fare for me in every Delta SkyClub I visit, traveling from time to time. Two guys seated behind me were engaged in animated conversation; I could not escape overhearing them. “I don’t know,” came the reply. “I think she was just raised with it and is guilted into going or something. Whatever.” These two men were smart, put together, thirty-something, poster boys for today’s generational archetype. I sat still, processing. My mother had just died; I was flying back to Indiana after my mother’s memorial service in Seattle. My mind was flooded with vivid and emotional memory from the last few days—holding her hands as she passed, kneeling by her bed, tearfully “letting her go,” listening to my youngest son, Nathanael, sing “Jesus Is All the World to Me” at the service, reviewing the pictures of a lifetime in my head. I heard a cell phone ringing. Heather’s husband answered, “Hey, Josh.” Pause, as he listened to Josh on the other end. “Yeah, I’m in the airport, waiting for my next flight. Uh huh.” More talk from the other end of the line. Then, “No way. You got the new house? Sounds like somebody’s living large. Yeah, I know Charlotte is changing, growing like crazy.” I think he was talking about Charlotte the city, as opposed to somebody named Charlotte. My head drifted back to kneeling by my mom’s bed. She had lived long and well. 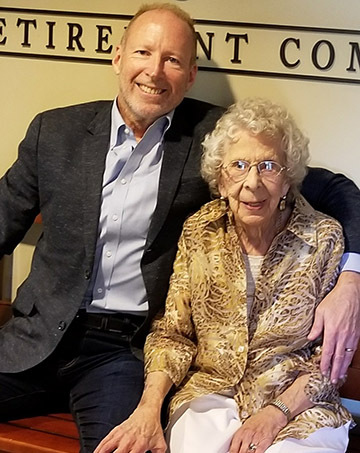 Approaching her 98th birthday, she was, frankly, a phenom. She lived independently, managed her own laundry every Wednesday, had her hair done every Thursday, went to the supermarket on Fridays, never missed church on Sunday, and all the rest. But, suddenly, she slowed down with pneumonia, spent some days in the hospital, went home, and passed away within the week. 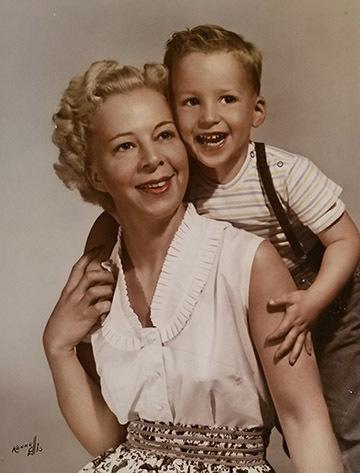 My mother’s tiny eighty-eight-pound frame was resting comfortably on the bed, her head turned toward mine. I grasped her hand and explained I had just stopped by to say hello. She didn’t have much energy for conversation, but she was content knowing I was there, always glad to see me. I retreated to the nearby couch and just watched her for a while, as she lay breathing softly, her eyes at half-mast. After some time flew by, at 8:45 pm I was impressed to kneel by her, once more, and tell her how much she was loved. As I took her hand in mine, I knelt on two knees, and whispered in her ear. “I love you so much, mom. Every day before I sleep I thank God for placing me in your arms so long ago.” She squeezed my hand twice, just then, as she has always done when agreeing with me. “But mom, it’s okay if you want to go and be with Jesus, face to face. Go and see dad, and Grandpa and Grandma Worthen, and Danny, and Uncle Johnnie and Auntie Lavinia…” I somehow unconsciously reverted to my childhood vocabulary, recalling uncles and aunts already gone. “…and Uncle Jack and Auntie Madeline and my precious Auntie Pauline and…” She squeezed my hand once more, tightly, and drew a deep breath. Her breathing paused and so did I. She then squeezed my hand sweetly one more time, took a second deep breath and then—and then—as I stared and started to cry—she left the room, her body, this world, and me, still kneeling, alone. It was as if a window to heaven suddenly opened and fresh oxygen blew past the curtains and surrounded us both; an extraordinary sense of eternity and life filled the space and clothed the moment. And then, just as suddenly, the window closed, the fresh air and my mom were, together, gone. But, the sacred space remained. I was frozen in place, afraid to break the spell or restart the clock. I remained motionless and wept, peacefully, for five minutes, before standing and seeking help. I thought about the house in which I grew up, my dad backing the car out of the garage so my mom and I could climb in and go to church on Sunday; we never missed. I remembered praying at the dinner table, heads bowed and hands folded, before anyone began to eat, thanking God for our food and home. I remembered the day my mom confronted me and a friend, as teenagers, about going to a movie of which she did not approve, challenging us to be careful with our hearts and minds, reminding us of our faith. I remembered how often our house was filled with Christian hospitality, people coming and going, laughing, enjoying, and loving, because of our faith. I remembered my mom sitting with me in the big red rocking chair when I was little, reading Egermeier’s Bible Story Book out loud. “Yeah, I hear you on that one. What difference does it make? Who needs it?” his friend chimed in. The morning after my mom passed away, I returned to her apartment to retrieve her purse and a few personal things I felt should not be left behind with no one at home. I remembered that my mom always kept her purse in her walker—the four-wheeled, fold-up, black metal friend that was her constant companion in her last years, thanks to osteoporosis. I opened the seat cover of the walker to find her purse and found a small notebook alongside. 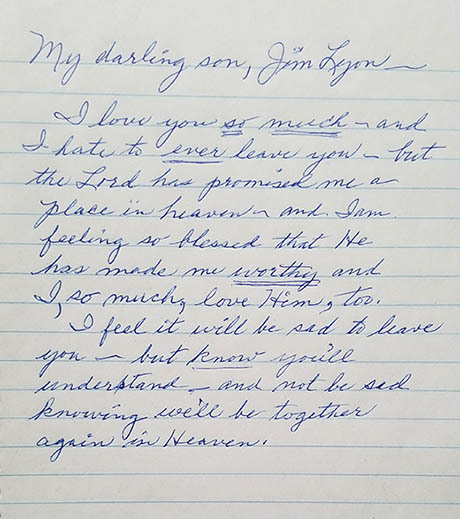 “I love you so much and I hate to ever leave you, but the Lord has promised me a place in heaven—and I am feeling so blessed that He has made me worthy and I, so much, love Him, too. And with this, then, she said, goodbye. My mother picked me up in an orphanage when I was four months old, wrapped me in a yellow blanket, and took me home. Now, she was going home. Yes, my mom was born in another age but, in the end, all of us face the same choices and cross the same bridges. Of all the loving things my mom gave me, introducing me to Jesus and His people was, hands down, the most consequential, the most important, the most life-giving. And, now that’s she’s gone, it is more significant than ever. “Man, we gotta run. The plane is boarding.” The two guys behind me at the SkyClub jumped off and ran for the door. I wanted to turn and engage them. To tell them that Jesus matters. And that there are churches that aren’t about church, but about Jesus. That Jesus is worth knowing and their kids need Jesus, too. That there will be a day when a door opens into eternity and nothing else will then matter. But, I was too late. I could only lift a prayer for them. I stood up to make another pass at the carrot sticks and cookie buffet. I thanked God for a Church of God that puts Jesus at the center and lives to be His hands and feet, His voice and touch. I thanked God for my mom. And, I thanked Him for allowing me to experience that window of eternity with her, even if but for a moment, so that I might never forget why church matters.